In December 2016 RTL will show at Christmas time three remakes of "Winnetou" - stories of Karl May under the titles "Winnetou - A New World". "Winnetou - - The Secret of Silver Lake" and "Winnetou: The Last Battle". During the recordings of the sloundtracks overseen by Heiko Maile composer Martin Böttcher, who had previously written the original music of many Karl May movies, visited the team. Maile, who has taken over the next three films themes and motifs also rearranged and orchestrated the scores forfilm producer Christian Becker (Rat Pack film). 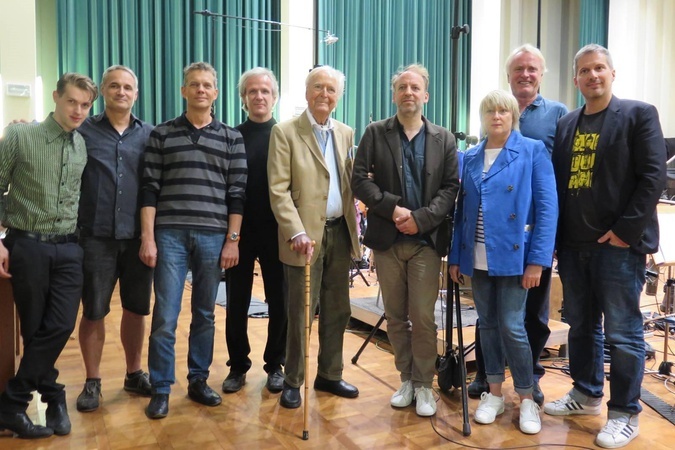 The legendary composer, arranger and musician was invited to the orchestral recordings with the German Film Orchestra Babelsberg. Böttcher was very pleased with the "modern implementation of his timeless melodies," share with the SMV Schacht publishers. Together with Jutta Bächner, Head of Creative / A & R / synchronization SMV he had "clearly enjoyed being amidst the orchestra crowd" at the live recordings. Martin Böttcher, began his career in the 1940s, and marked the upcoming movies as a new encounter with Karl May. Since the filming of "The Treasure of Silver Lake" from the 1962 score for the Karl May movies which Böttcher repeatedly created. He wrote in the 1960s, for a total of ten Karl May movies, the music, which he also contributed in the 1970's the soundtrack to the 26-part ZDF series "Kara Ben Nemsi Effendi". In 1998 he wrote the music for the two-part ZDF production "Winnetou's Return," and more recently Böttcher write in the years 2003 to 2013, the music for 21 episodes of the TV series "Pfarrer Braun" with Ottfried Fischer.